​What does it mean to be a self-published author today? The answer to this question largely depends on an author’s reason for self-publishing. Authors we work with have many good motives for choosing a self-published route. Some may be looking to help secure a publishing deal by offering a professional example to publishers of how their book could look and read. Others are wishing to become career authors and remain in control of their titles or simply to supplement an existing income with on-going royalties. Then there are authors on an adventure to complete a personal goal of simply writing and publishing a book or to compile a family history as an heirloom or gift. Specialist consultation services available to your self to achive your goals. Advice is given to help those who require various support and aspects covering Marketing 7 website design and promotion distribution. Whatever your genre, you will be competing for sales and since your book cover is your shop window, it absolutely must be beautiful. Whether on Amazon, iBooks or in Waterstones, your book cover will be seen before a reader even gets to page one, so it needs to look like a best-seller. We will design your cover as you want it, your input is vital to get the best result. To bring your book to the widest possible audience, you need to convert it to eBook and make it available to the online Kindle market and beyond. Our team of conversion specialists will make this a simple process. The conversion of text manuscript files into error-free, beautiful eBooks for Kindle and other eReaders is a process that requires specialist software, an eye for detail, and a thorough quality control process. Readers are used to viewing eBook titles prepared by publishers for professional authors and so it’s crucial that your eBook is up to that same high standard. Our eBook conversion team have perfected the process over hundreds of thousands of conversions, refining it to the point of obsession. We combine cutting-edge software that recodes your text styles and preserves formatting at over 99.5% accuracy, with the essential phase of quality control performed by a dedicated team of (human) proof-readers. We output the finely tuned files in both the formats (.mobi, .epub) you will need, simultaneously, so that the reading experience is nearly identical on all devices. The Way Forward Publishing Services will take your edited manuscript and deliver perfect eBook files ready to be uploaded without a hitch. Experienced authors will already understand the need for a thorough edit before publishing their work. A good story can be turned into a masterpiece when a professional editor takes your narrative and crafts it into a technically strong piece of writing, and this is what will give you those crucial positive reviews on Amazon, supporting sales and reinforcing your author profile. Although it can be difficult to hand over your carefully written manuscript to an unknown editor, most authors simply cannot effectively edit their own work. And while it may feel as if you’re allowing your voice to be changed, or that you just don’t need it, the opposite is almost always true. Our team of highly experienced editors work with your tone and style, and refine your work from a professional perspective. We have genre specialists on hand to ensure that no matter what the tone of your book, the right editor will be assigned to you. From thrillers to children’s books; sci-fi to biography, our team have the editing experience to support your creative flare. We use the ‘tracked changes’ method of presenting the edited files, allowing you to accept or reject changes as you see fit, and read the manuscript in either the fully edited or original state. This allows for a collaboration between author and editor, ensuring that your story is being told in the best way it can be; increasing your chances of five star reader reviews. Our authors are always very excited to receive their latest work in its fully edited state. It uncovers the true greatness of a great manuscript and prevents you from falling foul of mistakes that will later become evident and affect sales. We offer various editorial services to help you perfect your manuscript, from a light proofread to a full ghost-writing project. This service checks for errors of spelling, punctuation and grammar. It also highlights typographical errors, omissions or repetitions in your writing and points out any obvious breaks in the continuity of the piece. Basically, it finds mistakes before your book goes to print. This service covers all of the above and more. It’s a sensitive service, designed to retain, and be true to, the author’s ‘voice’. As well as the aforementioned proofreading checks, copyediting addresses the flow and style of your writing. Is your writing clear, concise and unambiguous? Does it always make sense? Is the text organised in the most logical manner? Are there any inconsistencies in your use of plot, characterisation or dialogue, for example? Copyediting moulds your writing to make it the best it can be; it makes your book come alive. Not everyone is equipped to be a writer, but that shouldn’t stop them from becoming a novelist. Some people have a great story in them, but not the time to get it written down. Others are simply unhappy with their own attempts to portray the story that they can see so clearly in their mind. The ghost=writing service offers a wide range of options to allow the author full control over their ghost-writing project. You can be as involved as you wish with this, and you always retain full control over the finished manuscript. Would you like feedback on your manuscript? Our editing team has decades of experience working with manuscripts at all stages of development, and this service gives tailored feedback, designed to help you move forward towards the best writing of which you are capable. Our feedback can focus on characters, plot, themes, style, or anything that you want us to focus on. We have much experience in designing and printing books. This affords us access to not only the best print production teams operating in the world today, but also the keenest prices. From Print on Demand to large volume runs, we are the authority on quality and cost. If you’re a medium-weight author with a couple of titles and you’d like to get a better unit cost, then a short-medium digital run could be be exactly what you need. The quality of digital presses is so close to lithographic (traditional method book printing) these days, that the difference is negligible. We can advise you on the best option, based on your timescale and budget. Experienced self-publishers will often require larger runs to meet demand, and that’s where traditional lithographic printing comes into it’s own. With an overall lower unit cost (cost per book), the litho printed book is ideal for those authors who are looking for a larger quantity of books to fulfil forecast sales figures. As an author, you will rarely be around to convince thousands of potential readers of your writing prowess, explain your style and influences or tell them what titles you are working on and, regardless of whether you are planning to sell your book directly from your own site or by using third-party selling platforms such as Amazon, your book sales success will be affected by how your potential readership perceive you. That perception is shaped by your book cover, book reviews and your profile or ‘author brand’ as presented on your website. If an Amazon customer reads a glowing review for your book, but they cannot find out who you are to reinforce and validate their decision to buy, they may not commit to the purchase. It’s not their financial investment that is the deciding factor as much as the time investment that they prepared to make into a serious author’s work. ISBNs and barcodes are essential basics for any self-publishing author. Linking into a system introduced in the early 70s, an ISBN is your book’s unique identifier and it allows you to take advantage of the internationally recognised cataloguing system. It’s easy to get one via The Way Forward Publishing Services. An often overlooked item, this 13 digit number is your ticket to retail accessibility, so it’s important that you allocate one for each of your print editions and of course your eBook versions. It may not seem too important to begin with, but as your book sales grow, your ISBN will be used by the book trade and public to identify and differentiate your books in all of their editions, check stock levels at retail outlets and perform library searches. Your ISBN is linked to all of your book data, making it a useful piece of information to help catalogue and map your products and presence as an author. You may already know that ISBNs are also used to generate the barcodes for each of your printed editions. We assist many self-publishers in the application of their allocation of ISBNs, which are available in blocks of 10, 100 or 1000. By applying for these, you become an independent publisher and all searches performed via any of your allocated ISBNs will return results bearing your chosen publishing name. At The Way Forward Publishing Services, we create publishing brands for independent authors who are looking to self-publish in the truest sense. Our clients tell us that there’s something incredibly satisfying about choosing a publishing house name, applying for ISBNs and seeing their own, independent publishing label’s logo on the spine of their latest title. So acquiring ISBNs is not just a box-ticking exercise, but also an essential and pleasing part of the creative process which ties your titles, your author profile and publishing label together. Once you have written your book, had it edited, converted to the relevant eBook formats, a beautiful cover designed and prepared for print, how will you best bring your creation to the millions of potential readers that are eagerly awaiting the next, newest reading sensation? Our clients approach distribution in a multitude of ways. A proportion of them choose to take 100% ownership of the process, creating individual accounts with the various retail outlets and print-on-demand facilities and manually driving traffic toward these locations. While it is true that one of the great things about self-publishing is the that you are able to take complete control of your marketing and retail opportunities, it must also be acknowledged that it can be a protracted process, especially since understanding the technical aspects of eBook creation and uploading and the standard requirements for successful, smooth printing are professional skills. The Way Forward Publishing Services offers seamless preparation and distribution of your eBook and print files to all the major retailers, affording you the time to concentrate on authorship and reducing the need for time-consuming troubleshooting during the upload and distribution process. Call us to discuss how we can help you not only to distribute your book quickly and easily, but how we can give you all the tools you need to begin driving traffic toward your retail pages, increasing sales and creating exponential marketing growth. Video is increasingly becoming a staple of online marketing. Nothing encapsulates the tone and content of your book as powerfully as a short video with a well written and beautifully spoken voice-over or stirring soundtrack. It may sound unachievable, but with The Way Forward Publishing Services, it’s not. The Way Forward Publishing Services believes in pushing self-publishing boundaries, and we now offer a video creation service that will give your book a powerful and professional advantage when it comes to sales promotion. A professionally produced video advert with music, a professional voice over and, of course, featuring your book cover. Your promotional advert can be used in hundreds of ways, from creating your own YouTube channel to sharing on Facebook, Twitter and your other social media. Your potential readership are a legion of book-hungry and media-savvy browsers who are becoming increasingly receptive to video promotions which means now is the time to get ahead of the game and embrace this blossoming media opportunity. The rising popularity of companies such as Audible, Overdrive and of course Amazon and iBooks’ audiobook download options means that your potential readers are very much accompanied by potential listeners. Commuters, gym-goers, children at bed-time and Sunday afternoon relaxers are waiting to listen to your next title. Make it available with The Way Forward Publishing Services audiobook creation service. From your manuscripts we create wonderful, professionally narrated audiobooks, ready for distribution to all the major outlets. The enthusiasm of audiobook aficionados cannot be denied. Those who love consuming books in this format often do so exclusively, claiming that the listening experience is superior in every respect to that of reading. It is said that the immersion achieved by cutting out external sensory pollution; noise and light, and plunging yourself into an audiobook is deeper, better and more engaging than reading from the pages of a standard printed title or an eReader device. The popularity of audiobooks is growing quickly - arguably because they are the most portable of book formats. You can listen to an audiobook anywhere with a pair of headphones and even engage with them while doing other things (not driving, naturally), so they are the perfect way to consume new titles if you are short of leisure time, space, or even if you don’t like reading. Book lovers all over the world are taking more and more notice of this rather underused format. Since Amazon acquired Audible in 2008, audiobooks sales have steadily increased, and the trend is looking set to continue. At The Way Forward Publishing Services, we cater to all of the needs of modern independent publishers, and as such we take the production of audiobooks very seriously. Our team of experts can lead you through understanding the particulars of audiobook creation, from choosing the most appropriate actor, to understanding file formats and technical issues, to distribution and sales. We can also offer recorded actor samples and can even create auditions for reading excerpts of your book. At the end of the process you will be in possession of a stunning version of your book which anyone can enjoy anywhere. Not every self-published book is a novel, and the sheer diversity of titles on which our clients ask us to work is necessarily accompanied by an extensive range of book specifications with specialist binding, paper stocks, custom sizes and finishes. From cookery books and portfolios to coffee table books, reference books, manuals and more, our print teams and designers are happiest when working on unusual books which take independent publishing in new and exciting directions. We love producing novels, and a significant proportion of our clients are amazingly talented story-tellers, however, we also work with authors who are interested in self-publishing more unusual titles. Our vast experience in traditional publishing means that there is nothing we don’t know about producing titles which are bespoke, unique and beautiful. A ‘specialist book’ might be described as any title which falls outside of the spectrum of the ‘standard’ specification of novels. Often these will be non-fiction, since informational titles typically require a bespoke design and print to accommodate their particular content. Cookbooks, portfolios, photography books, memoirs, coffee table books etc. are all items which we supply to our clients and each one is a work of art. If you are a professional with visual or informational content which could be made into a book, then creating a specialist publication could be exactly what you need to showcase your talents and demonstrate the world that you are the authority in your field. Perhaps you are an architect, poet, photographer or landscape gardener; whatever your profession, a book which beautifully presents your expertise and experience is the perfect sales piece to pass to your best prospects, and is fast becoming one of the most popular forms of self-promotion in professional industries. There are many articles which explore the marketing and promotional approaches of our authors - many of whom are selling very well indeed - and the main point which can be distilled from everything we have learned over the last two decades, is that marketing is effective when it leads people to a good looking, well-written book. So, once you have this cornerstone in place, how do you send people to it? Modern authors have a multitude of options available to support and accelerate the sales that will occur ‘automatically’ by having a great cover and some good reviews on the online retail outlets. So, what should you do first? Potential readers often want to know a little about an author to give be reassured that their potential investment of time will be worthwhile. To this end, open social media accounts, make them look good and allow readers this opportunity. From Facebook and Twitter, a website should be linked so people can go a little deeper into you and your titles and sign up to your mailing list. Your distribution setup is also crucial for visibility - making the right keyword choices for your Amazon account can enable you to tap into genre fans’ searching habits, while pricing your book correctly and having a great product description are ‘shop-window’ essentials. A press-release will help to give your launch some impetus and will be a good thing to have handy when you approach your local independent book-sellers. When you set up launch events, such as a book reading or signing, be sure to have business cards, postcards and posters handy to make a visual impact, and make people remember your title. 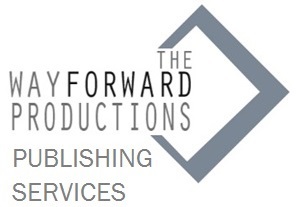 We at The Way Forward Publishing Services have worked very hard to offer you, the author, a comprehensive, affordable and quality alternative to the all too often frustrating world of conventional publishing. We offer the following services to enable you to realise your dream of becoming a published author. Consultation with a member of the team or Jason About how to publish and get your book ready. For just £705 you will receive all of the following or you can pick and choose which elements you want. Professional typesetters will manually layout your book in high resolution, ready for print. You can design your own cover online by choosing one of our images or your own design, and then add your text over the image. Your book cover front, spine, back, and inside text, will be typeset in high resolution ready for print. Once we have finished typesetting your book, we will e-mail you a proof of it for approval prior to going to print. Upon receipt of your approval, your book will be sent to press and one book will be with you within 2 weeks. Your book will have its own ISBN number assigned – this will enable you to sell it via any bookstore or internet site. We will register it on Amazon, so that it will be available for you or anyone to purchase via this site. We will convert your book ready for the digital market for sale on Amazon and other similar sites. Your book will be available from these companies for maximum UK distribution coverage. Your book will be available to be purchased online from stores such as Amazon, WHSmith, Foyles, Waterstones, etc. You have to submit your book to at least one of six main libraries – this is also included for you – but we submit to all six national libraries in the UK. Spend over £300 and get a review for you book cover from a published author. Using a local company we will convert your book in to an audiobook market making it accessible to a wider audience. yourself then a ghost-writer is the way to go. Print on demand allows you to order a book, one at a time if you like, from our website – simply log on, and place an order. Marketing is the key to let more people know about your book the more people that know about your book the more sale you might make. We will help you with you marketing for 2 months and will give you plane and contacts for the book to help you marketing can be very expensive but we give you some tools and guide you to help you achieve this on your own £350. We wish you good luck there are many routes to take to success depending the success you want.